Late night hosts scrambled in the wake of President Donald Trump’s late-afternoon press conference, with show tapings needing on-the-fly planning after the president's inflammatory comments provided too much material for the comedians to ignore. 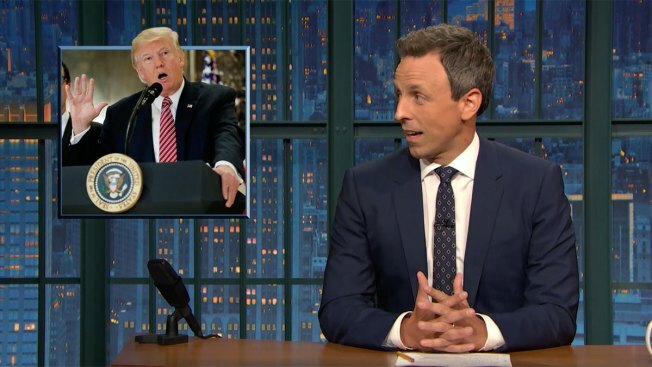 The "Late Night With Seth Meyers" host said that the press conference finished right before his show’s taping and broke down the president's comments in his "Breaking Crazy" segment. "President Trump this afternoon gave a press conference that can only be described as clinically insane," Meyers said. "You know that list at the end of a pharmaceutical ad? He apparently has all of them." President Trump went on to say that with the removal of the Robert E. Lee statue in Charlottesville, "where does it stop?" and referenced that George Washington and Thomas Jefferson were slave owners. "Where does it stop? Buddy, we've been asking that question since January," Meyers said. "Normally when someone is talking that level of crazy, Batman crashes through the ceiling and punches him." Images of White House Chief of Staff John Kelly during the press conference, where President Trump was not supposed to take questions, show his dismay during the comments. "Trump is so fully out of his mind, he broke a general. That guy's been in wars," Meyers said. "Remember when Mike Tyson bit Evander Holyfield's ear off? And then he bit his other ear off? This was the presidential equivalent of that," Jimmy Kimmel said on "Jimmy Kimmel Live" on ABC, referring to the press conference. Kimmel enumerated some of the events of the presidency so far and called on Trump voters to abandon him. "Treat this situation like you would if you'd put Star Wars wallpaper up in the kitchen: 'All right, I got caught up. I was excited, I made a mistake, and now it needs to go.' Now he does need to go," Kimmel said. The comedian then went on to propose his idea for going forward — making President Trump a king. "I have an idea, so hear me out on this … instead of president, we make Donald Trump king. We make him the first king of America. England has a queen. She lives in a palace, everyone makes a big deal when she shows up, she has no power at all. In the morning, they put a crown on her head, she stands there and waves, she goes back to bed — that's it … That's what we need to do with Donald Trump. We need to set him up in a castle, maybe in Florida, lead him to the top and then lock the door to that castle — forever." Stephen Colbert took no time addressing President Trump's press conference on "The Late Show With Stephen Colbert" on CBS. "He held a press conference today, I believe in the 7th circle of hell." The comedian went after President Trump’s defense that his first statement regarding the protests in Charlottesville was not specific in its condemnations of specific hate groups because he wanted to know the facts first. "I wait for the facts, okay. Just ask the millions of illegal voters who refused to look for Obama's birth certificate during my record-breaking inauguration. It's all on the Obama wire taps. It's all there." Colbert also referenced President Trump's response to questions about Steve Bannon, during which the president defended his strategist by saying he is not "a racist." "If the third thing someone says about you unprompted is 'he's not a racist' you've got a problem." As for Trump's comments suggesting that after the removal of a Robert E. Lee statue, statues of other public figures who owned slaves, such as George Washington and Thomas Jefferson, could be next, Colbert had a theory. "Spoken like a guy who's suspiciously worried that racist presidents don't get statues anymore," he said. When President Trump was asked if he was planning on visiting Charlottesville, he said that he owned one of the biggest wineries in the country there. Colbert rejected this statement. "It is not one of the biggest wineries in the United States, though he is one the biggest whiners in the United States." Jimmy Fallon leaves behind the jokes and laughs to solemnly address the weekend of violence in Charlottesville, Virginia, which he says made him "sick to my stomach." On Monday, the "Tonight Show Starring Jimmy Fallon" host set aside the jokes for his opening monologue and addressed the weekend's events in Charlottesville. 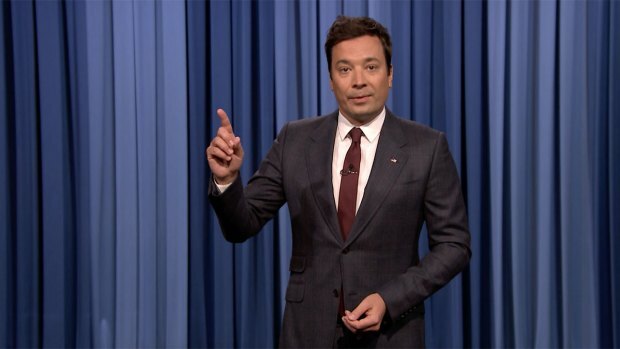 "Even though the 'Tonight Show' isn't a political show, it's my responsibility to stand up against intolerance and extremism as a human being," Fallon said, also referring to the events as "disgusting." The host mentioned his daughters and acknowledges the issues that parents face when discussing the events in Virginia. "My daughters are in the next room playing, and I'm thinking, 'How can I explain to them that there's so much hatred in this world?'" Fallon then called on "everyone, especially white people," to speak out. "Ignoring it is just as bad as supporting it," Fallon said. "We all need to stand against what is wrong, acknowledge that racism exists and stand up for what is right and civil and kind. We can't go backward."